Ranjbar, M., Yousefi, M., Lahooti, M., Malekzadeh, A. (2012). Preparation and Characterization of Tetragonal Zirconium Oxide Nanocrystals from Isophthalic Acid-Zirconium(IV) Nanocomposite As a New Precursor. International Journal of Nanoscience and Nanotechnology, 8(4), 191-196. M. Ranjbar; M. Yousefi; M. Lahooti; A. Malekzadeh. "Preparation and Characterization of Tetragonal Zirconium Oxide Nanocrystals from Isophthalic Acid-Zirconium(IV) Nanocomposite As a New Precursor". 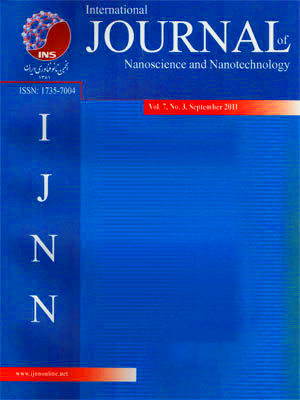 International Journal of Nanoscience and Nanotechnology, 8, 4, 2012, 191-196. Ranjbar, M., Yousefi, M., Lahooti, M., Malekzadeh, A. (2012). 'Preparation and Characterization of Tetragonal Zirconium Oxide Nanocrystals from Isophthalic Acid-Zirconium(IV) Nanocomposite As a New Precursor', International Journal of Nanoscience and Nanotechnology, 8(4), pp. 191-196. Ranjbar, M., Yousefi, M., Lahooti, M., Malekzadeh, A. Preparation and Characterization of Tetragonal Zirconium Oxide Nanocrystals from Isophthalic Acid-Zirconium(IV) Nanocomposite As a New Precursor. International Journal of Nanoscience and Nanotechnology, 2012; 8(4): 191-196. In this study, isophthalic acid-zirconium(IV) nanocomposite has been prepared from zirconyl nitrate pentahydrate and potassium iodide, with isophthalic acid, (C8H6O4=Benzene-1,3-dicarboxylic acid) as a ligand, via sonochemical method in ethylene glycol and methanol as solvents. The crystalline tetragonal ZrO2 has been produced by thermal decomposition of isophthalic acid-zirconium(IV) nanocomposite as precursor. Characterization of nanocomposite was carried out using element analysis, Fourier transfer infrared spectroscopy (FT-IR), X-ray powder diffraction (XRD), scanning electron microscopy (SEM) and thermal gravimetric analysis (TGA) techniques. The results demonstrated that, pure zirconia with particle size of about 49 nm was obtained in which methanol has been used as solvent during the reaction, particle sizes was significantly reduced to about 20 nm, when ethylene glycol used as solvent during formation of the nanocomposite isophthalic acid-zirconium (IV) as precursor.